Category Archives: The Beatles on Such a Fab Anniversary! As this day, February 9, circled on the calendar and marked as historic and a watershed moment for all citizens of the world, came closer, my desires floated around the act of revisiting the films the Beatles made–five films that shook the world. Perhaps A Hard Day’s Night shook the world the most and Let It Be shook it maybe a little less because it was, all at once, both a celebration of and an epitaph for a group of musicians who were able to change the universe with guitars, bass and drums. 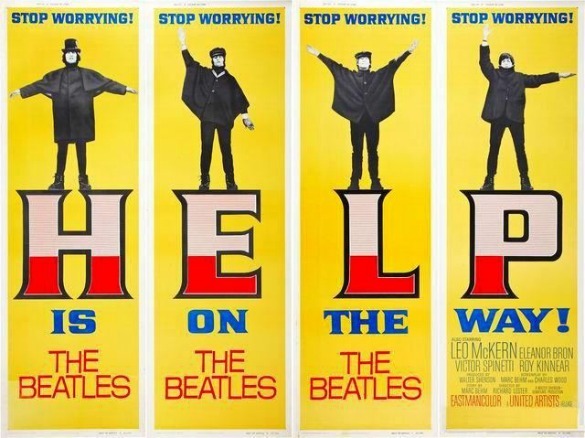 But it was the Beatles’ second film, Help!, that, at the time of its release, opened my eyes to the true excitement surrounding these four lads from Liverpool. I was 10 years old when Help! hit movie theaters in wide release in late August 1965. Knowing that they would not be able to withstand the crush of preteens, teens and other similarly aged fans attending such a major event, my parents dropped me off at the large, regally-appointed movie theater on Main Street in the village of Farmingdale on Long Island. As a pre-preteen, I was a little nervous to be left to fend for myself, but knowing that I had a quarter and could purchase maybe four or five kinds of candy to help me through this ordeal made me feel better. I opened the doors to the theater and made my way to a center seat. Even then, I knew where the movie theater sweet spot was. And then, after a short period during which it was blissfully quiet, everything changed. The world erupted around me! There probably were only a couple of hundred kids running through the doors that led to the theater, but it seemed like thousands. Perhaps millions! All of a sudden, I began clutching my candy with all of my might. I looked around, left, then right, then behind me, to find maybe every kid who lived within 10 miles of the theater surrounding me, grabbing any empty seat, plopping down, their legs hardly touching the ground, anticipating the arrival on the screen of John, Paul, George and Ringo. The screaming had already started. It rose as each second passed, a little, then a little more, then a little more than that, until the film began unspooling and then all bets were off. 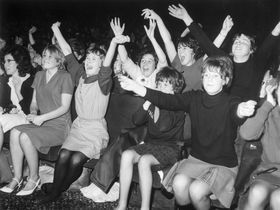 The kids, mostly girls, screamed and cried and screamed again, holding their sobbing faces as the Beatles spoke and sang. “Oh, John!” “Oh, Paul!” “Oh, George!” “Oh, Ringo!” Oh! As I put some candy in my mouth and started to chew, I felt a low rumble spread around me. It was the pounding feet of the other kids in the theater. They were all standing and stamping their feet as if there was no time left in the world to do so. Stamp, stamp, stamp! “Oh John!” “Ahhhhhhhhhh!” “Paul is looking right at me!” The world had spun off its axis. I was a ten year old boy surrounded by millions of screaming girls! What could I do? I had to escape. My remaining candy stuffed into my pockets, I vacated my seat and ran to the doors behind me. Flinging them wide open, I stopped in the basically empty lobby and took a deep breath. “Ahhhhhhhhhhhhh!” The low rumble was now much lower, but I could still feel it. The ticket taker and the people who worked at the theater were rolling their eyes. I was betting they wouldn’t be happy until the next movie came in–something that would elicit a quieter response, perhaps. Something that would invite a little–no, a lot!–less muss and fuss. I felt flustered, so I shuffled over to the refreshment stand and asked for some ice cream. “Whatever you’ve got, please,” I offered. I walked back to the doors, opened one, looked at the pandemonium still reigning inside the theater, and considered myself lucky. But I had missed most of the movie! I made up for my loss soon after. Visiting my aunt, uncle and cousins, I saw that my cousin Linda had the Help! soundtrack album. “Can I hear it, please?” My Uncle Murray put the record on the turntable that played through his high-end Fisher stereo system and I was instantly transported back to that movie theater. But this time, things were different…I could actually hear the music. All was suddenly right with the world. I pleaded with my parents all the way home from my cousins’ house: “Could you please buy the Help! album for me? Please? I didn’t get to see most of the movie and this would make it all better!” Sure, they said. Let’s make you feel all better. Help! was the first Beatles album I owned. I had singles, yes, but this was my first Fab Four longplayer. I wore out the grooves on that album in record time. I pored over every inch of the cover. I held it my hands. I sang along. I cried because the music was so moving to me, and that made me wonder if I was really so different from the millions of kids surrounding me at the movie theater. Had I actually wanted to stamp my feet along with them? Scream a little, too? Did I make a mistake not getting caught up in the whirlwind of emotion? It wasn’t until many years later that I realized that what I had experienced at that theater in the summer of 1965 was my own, virtually private demonstration of Beatlemania. It was one thing to experience Beatlemania from afar, but quite another to be in the thick of it. I wished I had acted in concert with those kids back then. 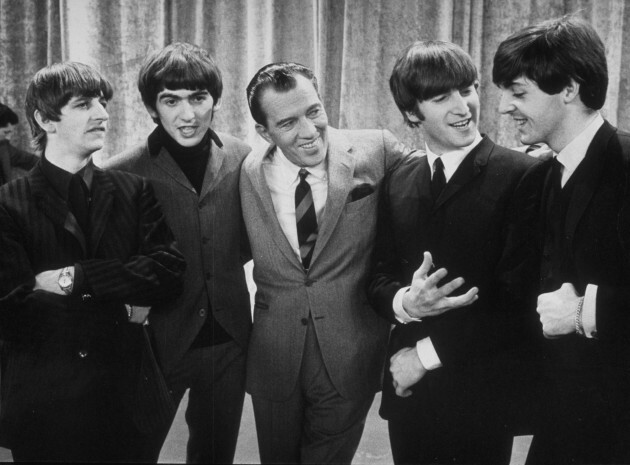 The Beatles and Ed Sullivan! Now, on the 50th anniversary of the Beatles appearing on the Ed Sullivan Show, as I anticipate my reaction to the performances on tonight’s CBS special–as I look forward to the sights and sounds of Paul and Ringo playing together again–I realize how all of the stars have aligned and taken me from preteen to adult. Everything has come full circle. Surrounded as I am by hundreds of Beatles books and albums and CD’s and magazines and newspaper clippings and more, much more, I realize I am in exactly the right place. I am celebrating along with everyone else. It is a quieter kind of Beatlemania. In many ways, I am still that 10 year old boy from Farmingdale, following the Beatles’ every step through the maze of success and wonder they passed through during their career together. The Beatles are still shaking the world. And God bless them for that.